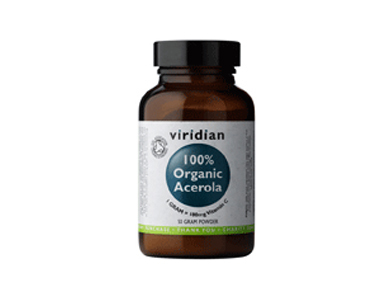 Buy Viridian 100% Organic Acerola Powder - 50grams in the UK from our online shop or directly from our independent Scottish store. If you want to automatically receive an email when '100% Organic Acerola Powder' is back in stock, just leave your email address below. A perfectly natural source of vitamin C from the acerola cherry. Certified 100% organic by the Soil Association. Where can you buy real 100% Organic Acerola Powder safely online? If you are wondering where you can buy Viridian 100% Organic Acerola Powder - 50grams safely online in the UK, then shop with us. 100% Organic Acerola Powder - Viridian 100% Organic Acerola Powder - 50grams in Vitamins A - Z and Vitamins and Minerals.